Marriott is a name synonymous with luxury. Paris is a name synonymous with romance, fashion, and haute cuisine. 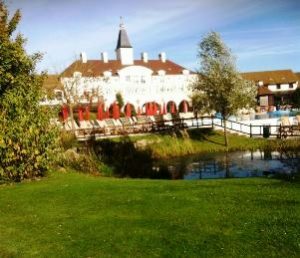 No wonder Marriott chose Paris to plays host to one of its most stunning European properties: Marriott’s Village d’Ile-de-France. These picturesque one-, two- and three-bedroom townhouses overlook the Golf Disneyland® course, located just a short distance from Disneyland® Paris. Accommodation comes complete with fully fitted kitchen, separate living and dining areas, washer/dryer, and a private terrace for your enjoyment. The on-site restaurant Le Bistro Bar serves all daily meals in case you’d prefer not to cook whilst on holiday. There is also a wide range of on-site activities to keep you and your family entertained. Being only twenty miles from Paris, all of the attractions of the City of Light are close by. This even goes for those not hiring a car, as public transport serves the area well. Surrounding forest and nature reserves are full of history; walk the same paths once traversed by such well-known figures as Joan of Arc and Charlemagne. There’s something for everyone at this stunning countryside retreat. This week, Travel and Leisure Group’s Kellie Hammond spoke to us about her recent stay at this Marriott resort. 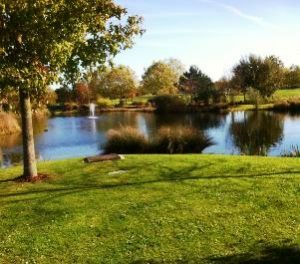 TLG: Why did you choose Marriott’s Village d’Ile-de-France for your holiday? KH: We’d been to Disney before with the children but wanted to go for a whole week this time. This gave us the chance to relax in a home-from-home environment and also step outside of Disneyland and visit Paris. KH: The resort facilities were very good. There is an indoor pool, a restaurant and bar. A shuttle bus can take you to Disneyland, which is only a few minutes’ ride away. There is a mini shop where you can buy all sorts, from bread and cheese to gifts for family back home. They even had cooked snacks such as croque monsieur. The best facility was the children’s club—it was so fantastic that the children asked to go there instead of back to Disneyland! The Marriott staff were amazing and they did so much with the children that we got to take a load off and relax. KH: The clubhouse for the children without a doubt. We could be as involved or uninvolved as we wanted. TLG: Why did you choose a timeshare resort as opposed to a hotel? KH: We have stayed in Disney resorts before. This time, however, we wanted to step away from the hustle and bustle of all that. Not having to queue for breakfast was especially great! Instead, we woke up each morning and cooked our own food in peace and quiet. Marriott are also known for the high standards, which was a big draw. KH: We visited Disneyland with the children of course and we used the train from Disney to Paris, which was unbelievably easy to do and was very reasonable cost-wise. KH: We will definitely return to d’Ile-de-France as it’s different from the norm—you each have your own house with a garden. It’s fully equipped with everything and the maids come in and clean everyday and even do the washing up or load the dishwasher. It’s perfect. Next though, I think we will visit Marriott’s Phuket Beach Club in Thailand as I have family that live out there and would love to see how different the resort is compared with the French one. If you’re looking to buy timeshare at Marriott’s Village d’Ile-de-France, don’t hesitate in contacting Travel and Leisure Group at your next convenience. You’ll receive first-class service from our friendly Buying team, who will be able to offer you weeks at over 50% off developers’ prices and give you comprehensive advice and recommendations from over two decades’ worth of experience in timeshare resale.